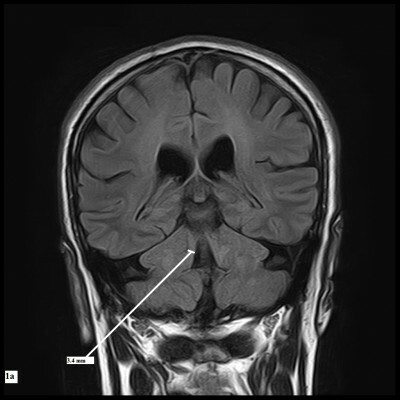 Objective: The objective of the study was to assess magnetic resonance (MR) planimetric measurements and MR parkinsonism index (MRPI) in differentiating progressive supranuclear palsy (PSP) from Parkinson’s disease (PD) using 1.5 and 3 T MRI scanner. Subjects and methods: After ethical approval was obtained, analysis of 34 consecutive patients with PSP, 34 patients with PD and 34 healthy controls (HCs) was performed. HCs were age-matched adults without any history of neurodegenerative disease or movement disorders. Retrospective data from the past 10 years (from January 2006 to December 2015) were obtained from the Hospital Information Management System, and informed consent was obtained from all participants. The measurements of pons area–midbrain area ratio (P/M) and MCP width–superior cerebellar peduncle (SCP) width ratio (MCP/SCP) were used, and MRPI was calculated by the formula ([P/M]×[MCP/SCP]). Results: Midbrain area and SCP width in patients with PSP (19 males, 15 females; mean age =66.7 years) were significantly (P<0.001) smaller than in patients with PD (20 males, 14 females; mean age =66.7 years) and control participants (17 males, 17 females; mean age =66.1 years). P/M and MCP/SCP were significantly higher in patients with PSP than in patients with PD and control participants. All measurements showed some overlap of values between patients with PSP and patients from PD group and control participants. MRPI value was significantly higher in patients with PSP (mean 21.00) than in patients with PD (mean 9.50; P<0.001) and control participants (mean 9.6; P<0.001), without any overlap of values among groups. No correlation was found between the duration of disease, PSP rating scale, PSP staging system and MRPI in this study. No patient with PSP received a misdiagnosis when the index was used (sensitivity and specificity, 100%). Conclusion: MRPI should be made an essential part of all MRI brain reporting whenever differentiation between PD and PSP is sought for.